Does anyone know why my glyph browser doesn't always load the glyphs? The panel appears but it is empty, but this only occurs sometimes. Is it a glitch or am I missing something? 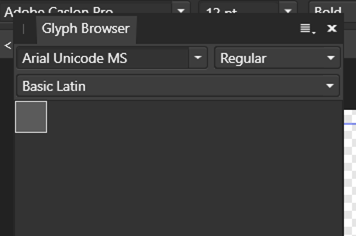 I've just tried replicating this a number of times in both Designer and Photo, by opening and closing the glyph browser and each time the glyphs showed up. When they don't show you for you, are any of the menus clickable on the glyph browser and do they show any options? I just opened a new document in Affinity Designer. I used the text frame 3 times. On the third occasion, it happened. Yes I can click on the drop-down boxes and they open, it is just the glypths that don't load. After, taking this clipping, I went back to the document to actually change the font and it had loaded in the mean time. It seems like some sort of delay. Thus, I will see if waiting or clicking on various things, such as minimising the screen have an impact.